The Organization of the Petroleum Exporting Countries (Opec) along with Russia and its allies, including a stubborn holdout Iran, has r0eached a last minute deal on a larger-than-expected production cut, in a move that could mop up a burgeoning global crude-supply glut, said media reports. The deal comes despite pressure from President Trump to maintain current output levels and keep prices low. Under the deal, Opec nations would cut 800,000 barrels and the Russia-led group would handle the remainder, reported Wall Street Journal. Oil prices shot up on Friday after the Opec meeting which decided to reduce oil production by a total of 800,000 bpd, while non-Opec nations, led by Russia, are reportedly adding another 400,000 bpd of cuts, for a total of 1.2 million bpd OPEC+ production cut. At 09:31 a.m. EDT on Friday, WTI Crude was soaring 3.73 per cent at $53.41, while Brent Crude was surging 4.15 per cent at $62.55. Under this agreement, Saudi Arabia, Opec’s de facto leader, will make the biggest cut. Russia, which is not an Opec member but is an increasingly important factor in global oil markets, will account for much of the rest, said Oil Price.com. The Opec deal had hung in the balance for two days - first on fears that Russia would cut too little, and later on concerns that Iran, whose crude exports have been depleted by US sanctions, would receive no exemption and block the agreement, reported Reuters. But after hours of talks, Iran gave Opec signals that it was ready to cut more. Iran was the last holdout in the talks within Opec, which dragged on from Thursday after members failed to agree on the size of a cut and who would be exempt, it stated. As talks resumed on Friday, Iran continued to refuse to accept wording that it would ‘cut’ and insisted on ‘exemption’, remaining the only sticking point in the Opec negotiations, while the deal broker, Novak, flew in from Moscow for the non-Opec part meeting, and sat down for separate talks with each of oil ministers of Iran and Saudi Arabia, Bijan Zangeneh and Khalid Al Falih, respectively. 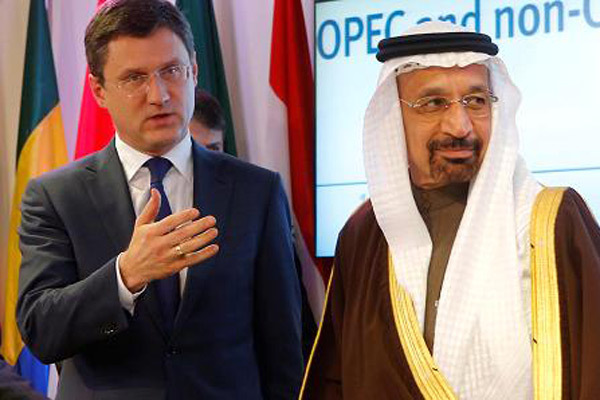 As the talks began on Friday, reports emerged that Russia may be ready to cut its oil production by 200,000 bpd as part of a deal with Opec to reduce oil supply—a higher commitment than 150,000 bpd previously aired. Russia, Saudi Arabia and the US have been vying for the position of top crude producer in recent years. The US is not part of any output-limiting initiative due to its anti-trust legislation and fragmented oil industry. Asked whether the decision to cut could sour Riyadh’s relations with Washington, Al Falih told reporters the kingdom was ready to pump more should a major supply outage occur, reported Reuters. “We will not squeeze consumers beyond what they can afford,” he said, adding that given the US had recently become the biggest oil-producing nation, its energy companies were “breathing a sigh of relief”.